This is the second in a series on small Ecuador hotels. 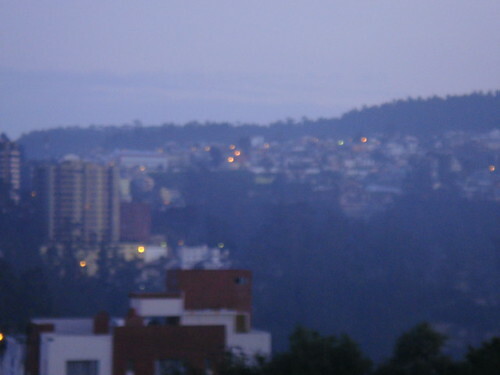 When we look at small Ecuador hotels in Quito, I have to first mention Hotel Quito. 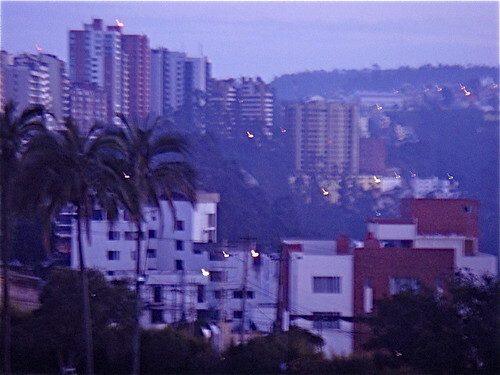 We lived here for years and have sent hundreds of delegates here… plus conducted many seminars at Hotel Quito. Hotel Quito is not a small hotel. Hotel Quito is an old hotel that has been nicely renovated. Originally in the 1950s it was an Intercontinental that, after leaving the franchise, fell into disrepair. Several Swiss and German friends of ours took over the management about a decade back and did a tremendous job getting this old operation back into top form again. The rooms are okay… but the location and gardens are superb. The views are beyond world class. 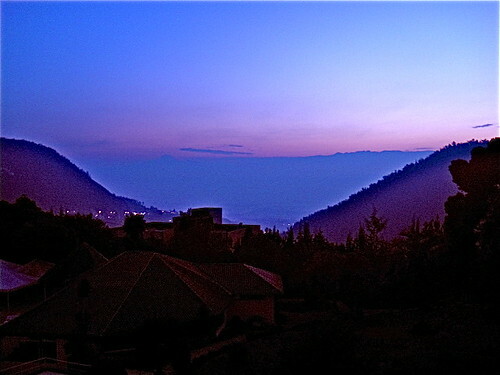 One of my favorite sports is rising before dawn at Hotel Quito and watching the day break that begins with the faintest of hues… painting the sky with a purple coral patina. Slowly the mountains and valleys in the distance take form. The lights in the high rise condos fade. 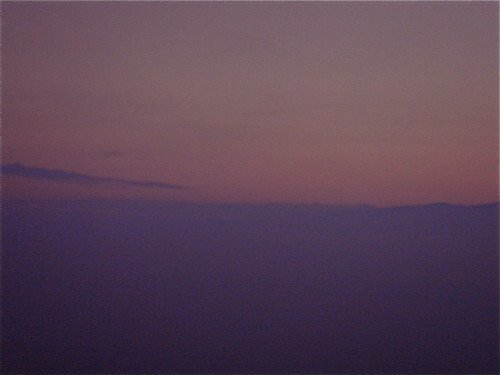 and the city in the distance reveals itself. The steam room and pool open in shadows. Merri and I enjoy a steam, turco as it is called in Ecuador (Turkish Bath). 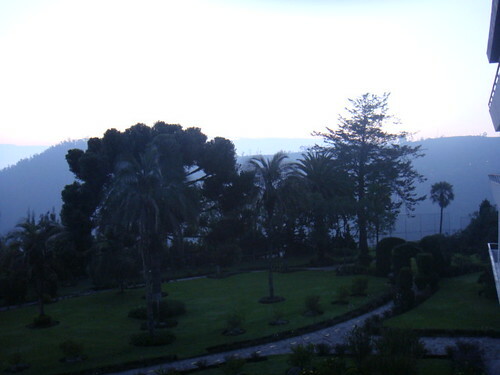 There are few places where you can find gardens that are lush twelve months a year, filled with tropical flowers and fruits, coconuts, hibiscus, lemons and orange, yet having flowers from the north (fuchsias, roses and such) as at Hotel Quito Ecuador. 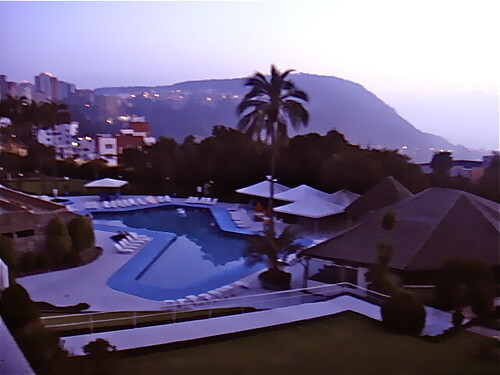 We have a lovely routine of a long swim in the Hotel Quito Ecuador Olympic sized heated pool which overlooks the entire city, then a nice long steam in their white tiled Turkish steam bath (filled with fresh eucalyptus leaves). going to the restaurant Techo del Mundo (top of the world) on the 13th floor for a great buffet breakfast, still inspired by the Swiss. You can enjoy the morning and buffet. I especially love the yucca rolls, the multitude of fresh tropical fruits and not least a huge bowl of Macadamia nuts. They serve a great breakfast buffet of tropical fruits and fresh juices (a delicious blackberry or tropical exotic fruits), homemade Swiss muesli (loaded with currants and mango), fresh French bread, free range eggs, corn tamales stuffed in banana leaves and of course cafe con leche. 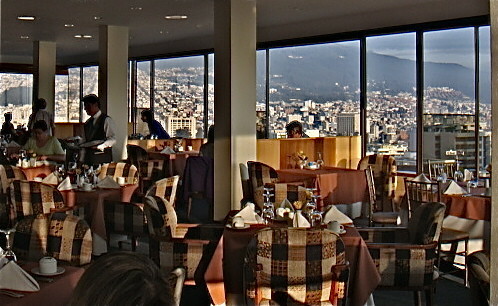 Techo provides a view of the entire city from the top floor of the hotel and has the distinction of being the second highest restaurant in the world with panoramic views. Here is the lobby of Hotel Quito. Sadly since the new management added a casino it has been harder to get reservations. 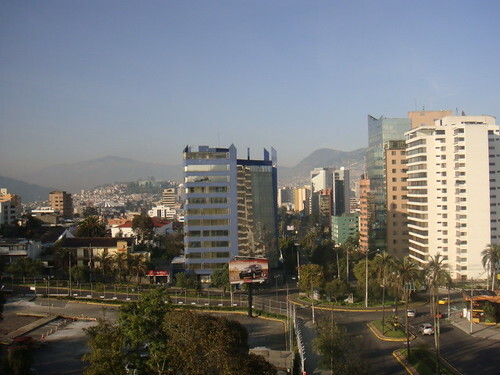 We now use other hotels for our groups to make sure we can get rooms… but if you are in Quito for a while it’s worth seeing if you can get a room at Hotel Quito. We offer a small hotel reservation service and can obtain a discount at a number of Ecuador hotels for our Ecuador Living subscribers. 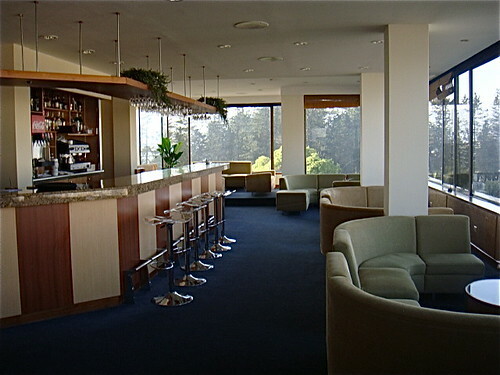 For example at Hotel Quito we can get a savings of $40 a night off the normal room rate. 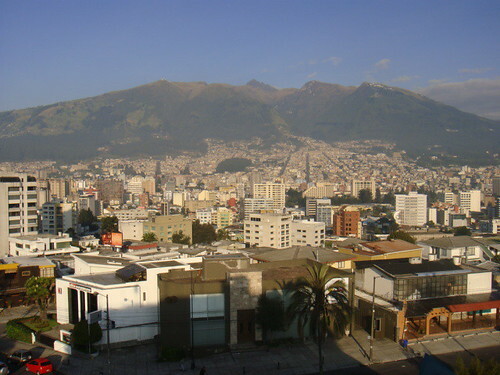 Staying at Hotel Quito three nights saves the Ecuador Living subscription fee. To learn how to subscribe to Ecuador living click here. Until next message, we hope to see you in Ecuador! 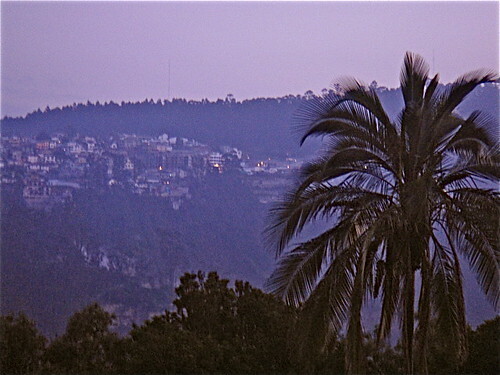 Another View from Hotel Quito. 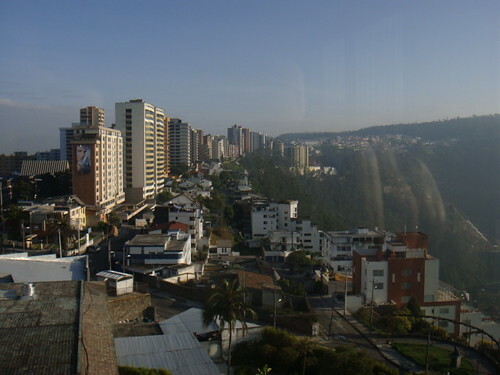 An Upcoming message will review a small Ecuador hotel nearby.